The Body Shop has today launched a new campaign, calling for a global ban on animal testing in cosmetic products and ingredients by 2020, revolutionising the beauty industry and protecting millions of animals around the world. Partnering with the leading non-profit organisation working to end animal testing, Cruelty Free International, The Body Shop will take the campaign to the highest authority, the United Nations, and request an international convention banning cosmetic testing on animals. The potential for animal testing is still a huge risk around the world, with 80% of countries having no laws against animal testing in cosmetics. This is despite the fact that most countries do not require safety data based on animal tests and reliable alternatives are available, and that beauty companies like The Body Shop use innovative and effective cruelty-free ingredients in their products. Cruelty Free International estimates that approximately 500,000 animals are still used in cosmetics animal testing every year. Rules on animal testing in cosmetics are currently patchwork, with legislation differing around the world leaving consumers ill-informed. Traditional animal tests have never been validated for their use in reliably detecting the safety of cosmetic products and ingredients. There are now modern alternatives such as artificially grown human skin, that are, in the majority of cases, as effective as the animal test they replace and have been validated by authorities. Jessie Macneil-Brown, Senior Manager International Campaigns and Corporate Responsibility, The Body Shop, says: "The Body Shop passionately believes that no animal should be harmed in the name of cosmetics and that animal testing on products and ingredients is outdated, cruel and unnecessary. This is why The Body Shop and Cruelty Free International have partnered to deliver the largest and most ambitious campaign ever to seek a global ban on the use of animals to test cosmetic products and ingredients. "This campaign will finish what we both started back in the 1980s. We are calling on at least eight million people from every corner of the globe who care about animal welfare to join our cause and sign our petition. We will take this petition to the United Nations to call on them to support a global ban on animal testing in cosmetic products and ingredients. Michelle Thew, CEO, Cruelty Free International says: "People are confused about animal testing. The world over, people want this cruel practice to end, yet existing laws are a patchwork of different rules with some very big gaps. While more and more countries require non-animal safety tests and many have taken steps to prohibit cosmetics testing on animals, there is more work to be done. Where animal testing is allowed - on both products and ingredients - most countries do not require testing data to be made available to the public or even to regulators. This makes it extremely difficult to know how widespread animal testing is. Because 80% of countries around the world still allow animal testing in cosmetics, a global ban is the only way to truly eliminate animal suffering." The Body Shop and Cruelty Free International's new campaign is calling for an international ban on animal testing in cosmetic products and ingredients, everywhere and forever. It is the most ambitious campaign ever against animal testing, and aims to engage eight million people to sign the petition calling on the UN to introduce an international convention to end the practice once and for all. 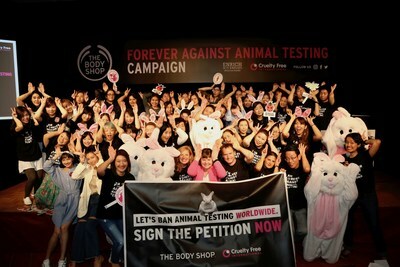 The petition can be signed online or at any The Body Shop stores across the world. Consumers are being encouraged to use the campaign hashtag, #ForeverAgainstAnimalTesting, on social media to raise awareness of the issue.